After my work trip, I knew I would be picking up my boyfriend from LAX in the late afternoon. We could only spend 12 nights in California and although LA had a lure for us, we had other places on our agenda where we wanted to spend longer. 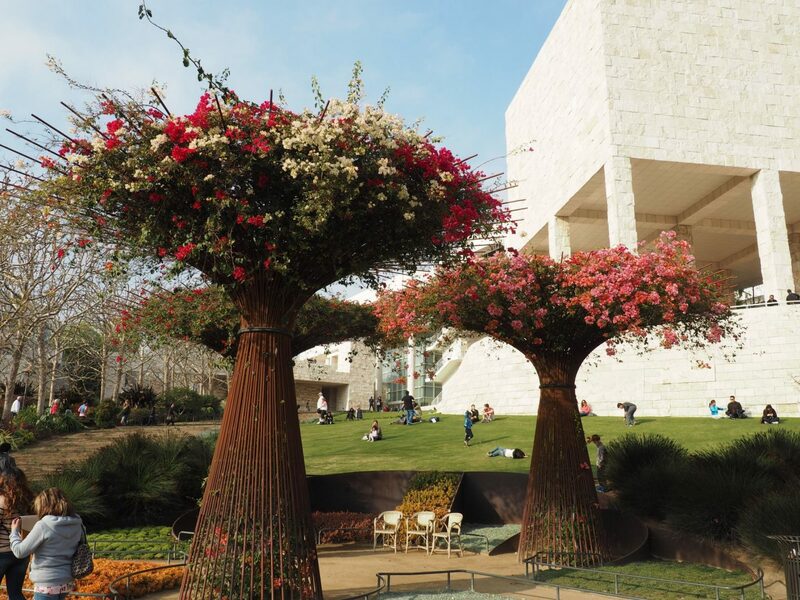 We decided to spent three nights in LA, which equated to two full days. We decided to stay the The Hollywood Roosevelt hotel, which was a bit of a dream come true because it is somewhere I’ve followed on Instagram for ages and the hotel crops up everywhere online due to its proximity to the Oscars every year and, of course, Marilyn Monroe lived there for two years! The hotel was absolutely huge and hands down the fanciest hotel I’ve ever stayed in – we managed to get three nights for just over £600 thanks to an Expedia deal. It actually equated to £173 per night (reasonably priced for a hotel in LA but pretty expensive by UK standards!) plus tax. Hotel tax in the US is mental and often payable upon arrival. Always check and budget accordingly! We got an incredible corner room and we could see the Hollywood sign from our bedroom window. I didn’t think I’d be too fussed about seeing it but having that view from our hotel room was really special. Heading west on holiday means jet lag gets you up early, which I like until the 4pm crash! On our first full day, we woke up around 5am and decided to do the famous Runyon Canyon hike. The bottom of Runyon Canyon Park was just a 15 minute walk from our hotel and as we set out early, we were almost the only people walking along Hollywood Boulevard and the Walk of Fame – amazing considering it’s one of the city’s biggest tourist traps. 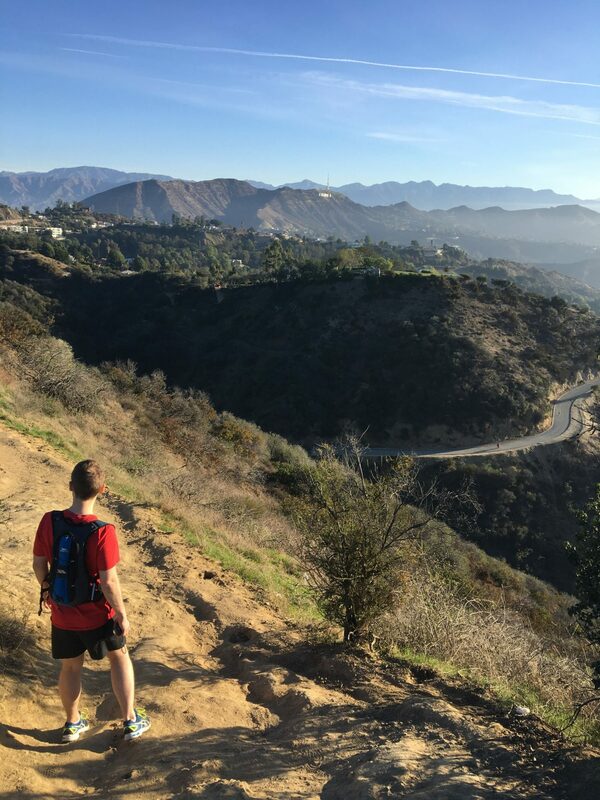 Runyon Canyon offers easier paved hikes or more difficult off road routes. We opted for the harder option (unbeknown to us at the time of decision, I have to say) and we were sweltering by the time we got to the top. The view was all worth it, though. We could even see as far as Downtown LA with its endless skyscrapers. You could also see some of the famous luxury homes in the Hollywood hills, which is pretty incredible. Runyon Canyon is basically dog lover heaven – there were so many dog walkers wearing those belts with multiple dog leads! After heading back to the hotel and showering, we decided to walk to The Griddle Cafe that is famed for its pancakes. NB. No one seems to walk anywhere in LA, which explains the city’s insane traffic problem. The walk to breakfast was around 30 minutes and we barely passed anyone. It’s important to plan ahead and check routes if you’re planning to walk because it’s easy to wander into areas where you won’t be welcomed. The Griddle Cafe was insane and our first taste of the crazy portion sizes that the US is famed for. 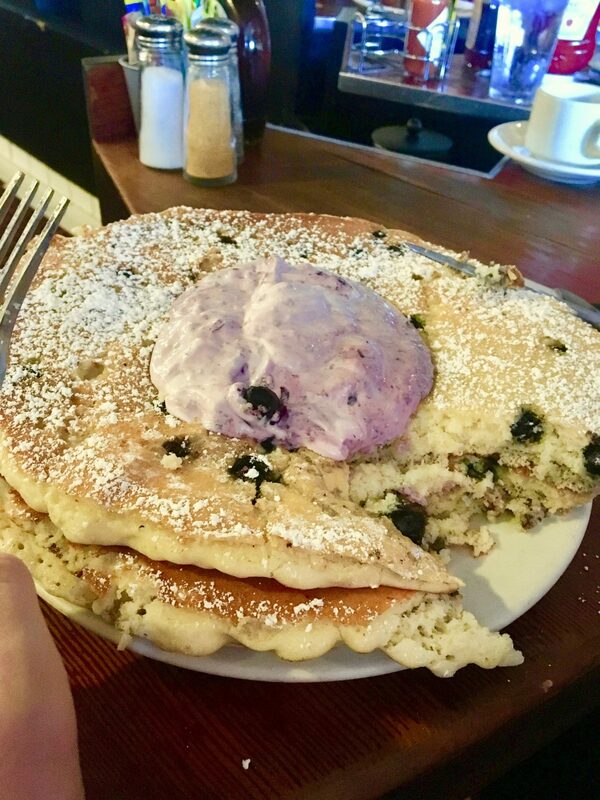 Matt ordered the pancakes and he barely made a dent in them – three thick, dinner plate-sized pancakes smothered in blueberry sour cream, berries and icing sugar. They were delicious but we couldn’t even clear the plate after a team effort! 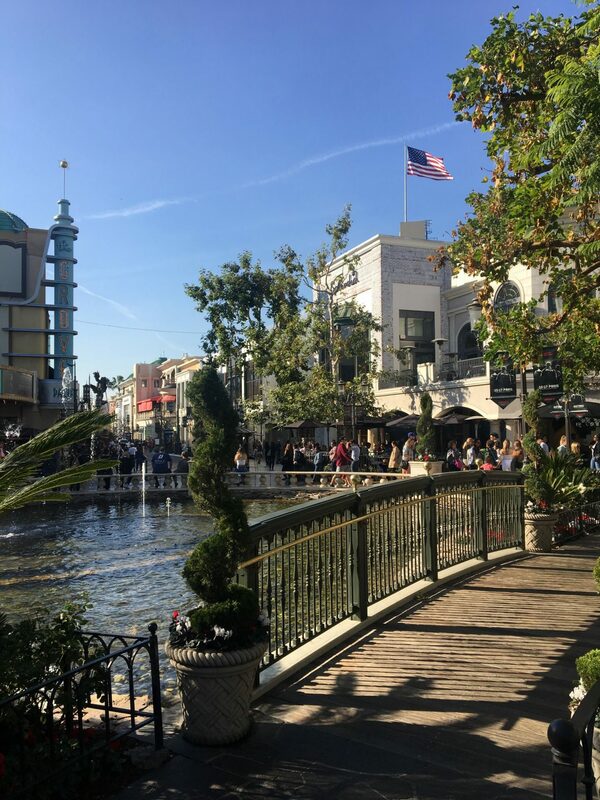 After food, we decided to walk to The Grove, a famous shopping and dining complex (again, I would recommend getting an Uber for this journey). Water fountains, sculpted trees, Danny DeVito casually walking past – Westfield, it ain’t. There’s also a really cool farmer’s market that offered fresh fruit and food made to order which looked incredible but our stomachs were still bulging from the pancakes. We sat outside with a cocktail at 189 by Dominique Ansel to take some time to people watch. 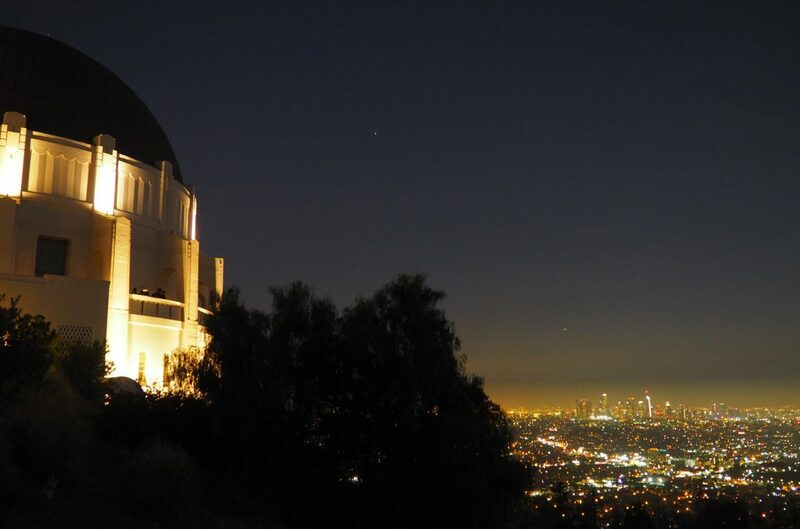 From here, we got an Uber to the Griffith Observatory – a holiday highlight for me. Naturally I was thrilled to be in the same spot where Ryan Gosling and Emma Stone once twirled around and the setting was just stunning. 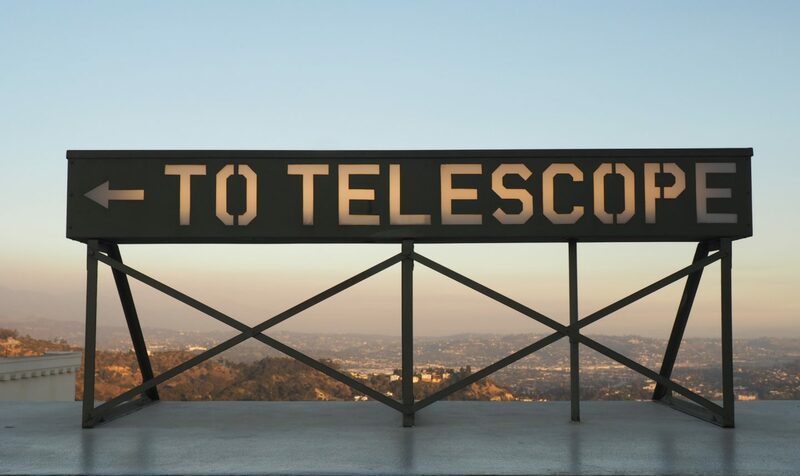 You must visit the observatory at sunset – I made this same recommendation to friends whose honeymoon I organised and they loved it. We decided not to go to a planetarium show, instead loitering outside to admire the amazing views as the sun set. I can’t put into words how beautiful is was – I really hope to visit again one day. There are a lot of Hollywood-style bus tours to choose from, but we opted for the more interesting Warner Bros Studio Tour. We booked our tickets the night before to ensure we could get a spot on the first tour of the day – there are around 10 people to a tour. I really enjoyed the tour! 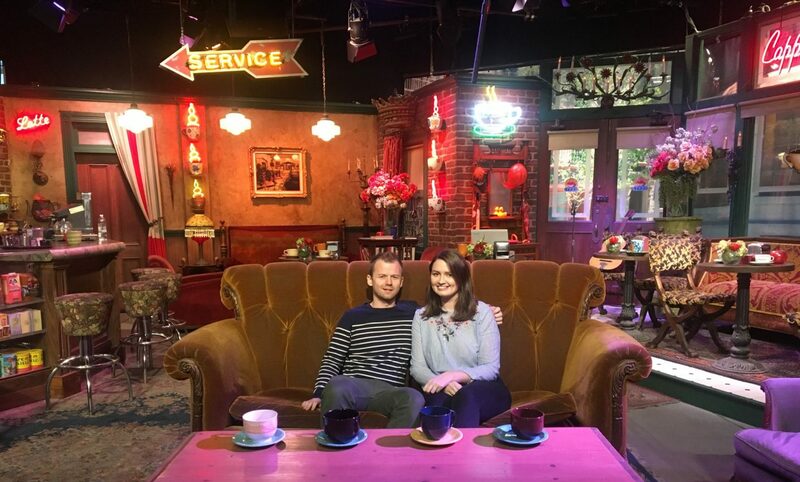 We were shepherded around on a big golf cart by a very knowledgable and funny tour guide, driving and wandering round the famous sets of TV shows and films like Batman, Gilmore Girls and Friends. There’s a pitstop at an exhibit that features lots of Harry Potter memorabilia and props – needless to say I was thrilled about this and had to have a photo with Dobby! There is also another studio filled with thousands of props – many were labelled by TV shows who wanted to borrow them! – and a stop at the Big Bang Theory set. 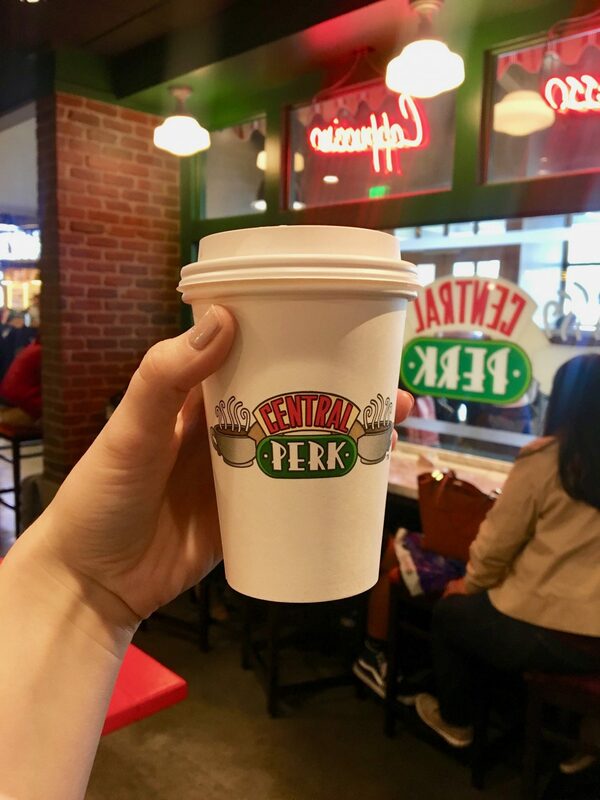 A photo opportunity at the Central Perk set from Friends was potentially the cheesiest part of the three-hour tour, but it was good fun and the photos make me laugh looking back! 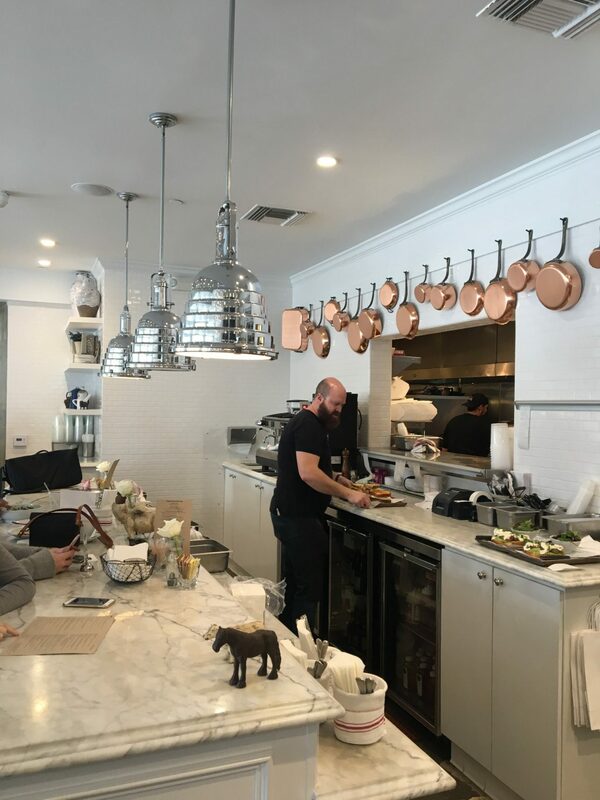 From here, we headed to nearby Olive and Thyme for lunch. The decor was so lovely and had a really friendly vibe. We both had the sourdough grilled cheese and shared some fries – it was incredible! 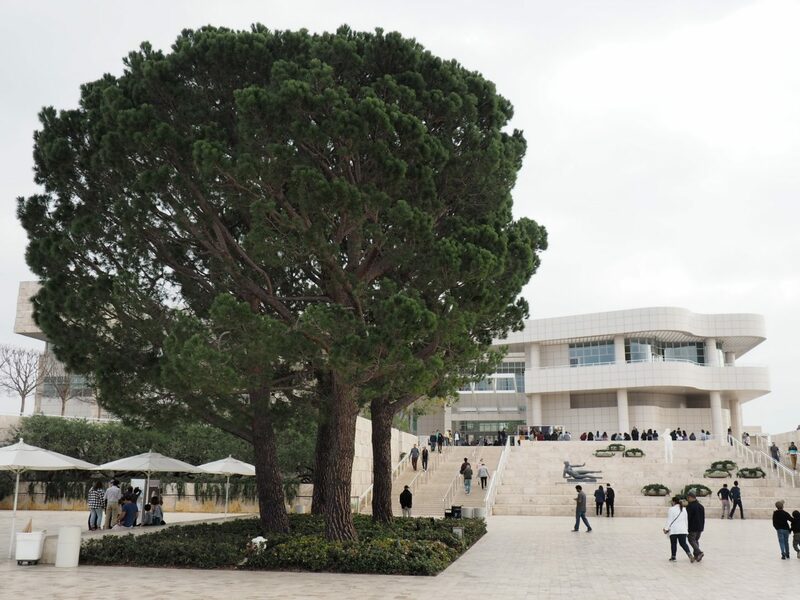 We jumped in an Uber and headed to the Getty Center, a famous museum in the Los Angeles hills. 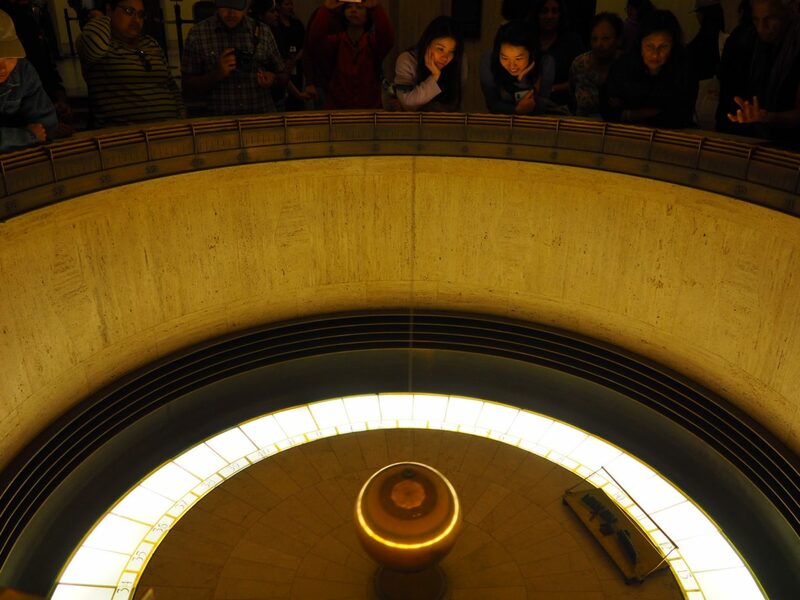 I would say this is the only thing we did that I wouldn’t really recommend – the museum’s contents weren’t groundbreaking and inside was heaving with visitors. It is, however, architecturally beautiful and the gardens are like nothing I’ve ever seen. 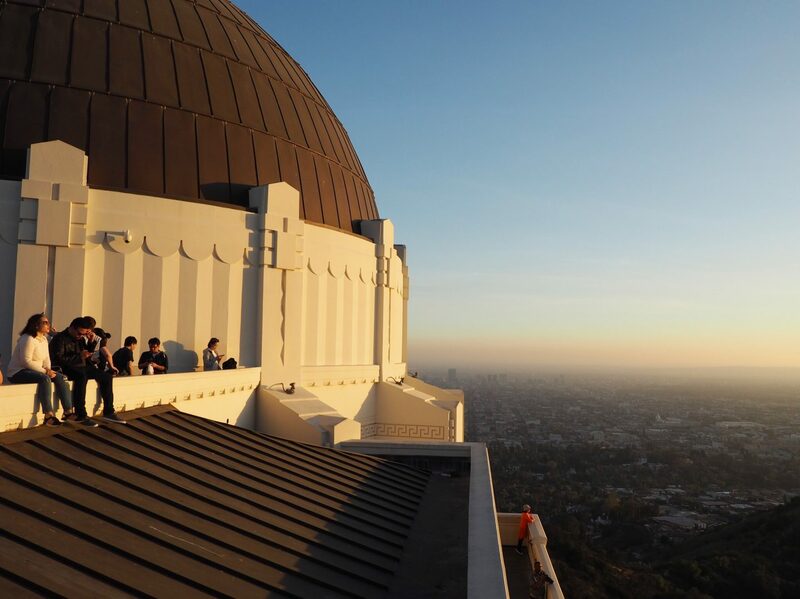 It’s quite out of the way compared with all the other popular LA things to see and do and probably not a good use of time if your hours are numbered. It did boast the most incredible cacti plantation I have ever seen, a photo of which I use as my blog homepage header! We got another taxi to Rodeo Drive, just because. 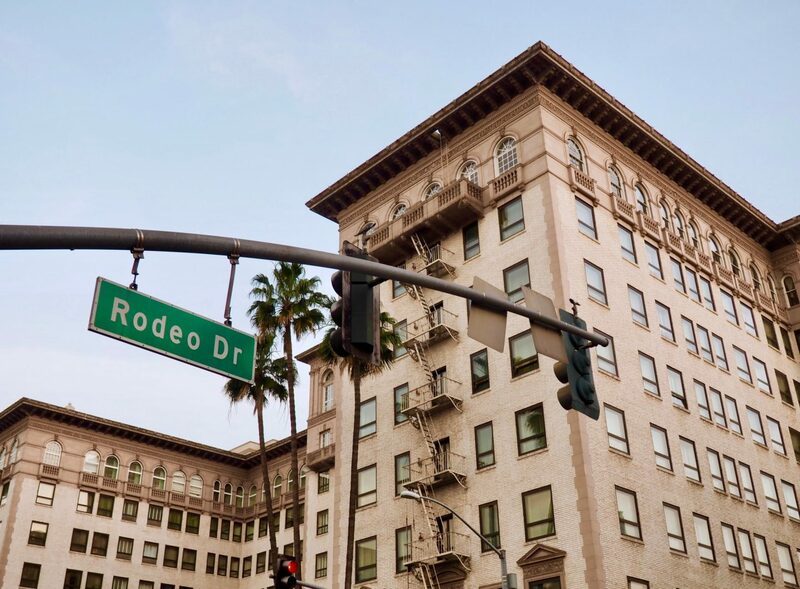 Rodeo Drive is one of the most well known roads in the world and it was such a unique experience. People parking up their Lamborghinis to run into Chanel, women with tiny pooches in one hand carrying three Gucci shopping bags in the other. It was a great people watching spot and a taste of how the other half live, but the highlight was definitely seeing a chihuahua wearing a tiiiiiny pair of sunglasses. If only I had a photo! That evening we ate at the Saddle Ranch Chop House in West Hollywood aka the most stereotypical American bar and dining experience you could imagine – it had a bloody mechanical bull! Matt and I each ordered tacos and they came out on a platter – each – which may have been okay if we hadn’t shared another trough of nachos just before! I’ll never get my head around American portions, it blows my mind. Americans must be so shocked when they come to the UK and eat out! 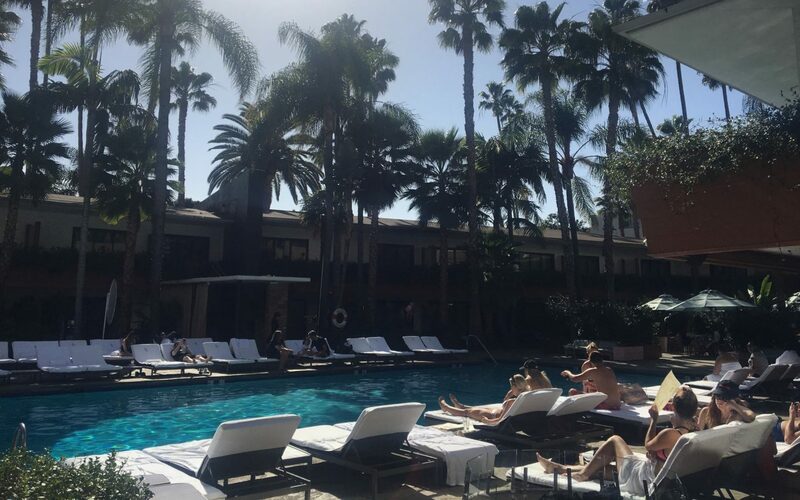 And that is that – two whirlwind days in LA! Before we checked out the next day, we went for a wander along the Hollywood Walk of Fame. NB. The Walk of Fame couldn’t be further from the glamorous spot it’s made out to be. It’s dirty, loud, heaving with people and is unfortunately home to a lot of people who live on the streets and seemed to have mental health issues. I want to write about this more at length at some point, but that really is a side of California that no one ever talks about – the homelessness is on a level I have never, ever experienced. 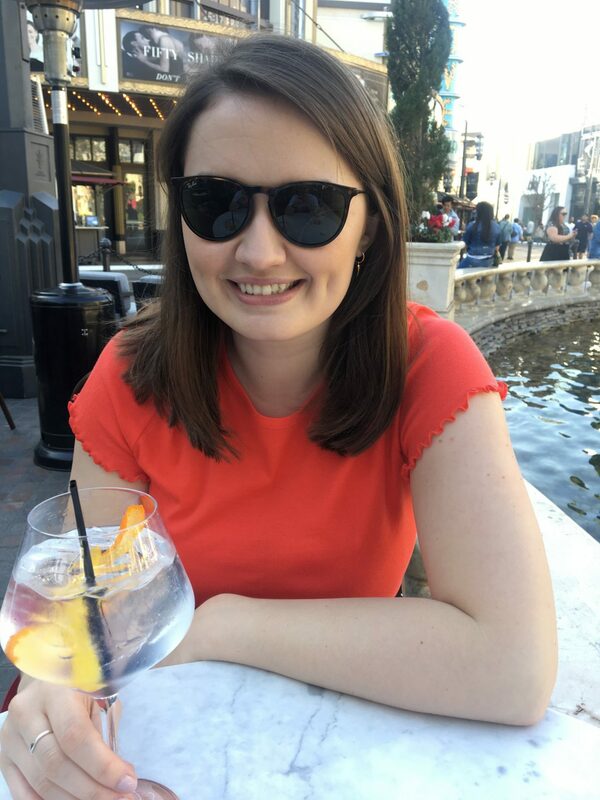 We then went for lunch at California Pizza Kitchen – a US restaurant chain which is a good back up when you need a quick and safe lunch – and checked out. Next stop, Santa Monica! If you’ve managed to get this far, thank you for reading! I’m nearing 1,500 words, literally an essay! I hope you enjoyed this first instalment of my series of California road trip posts. 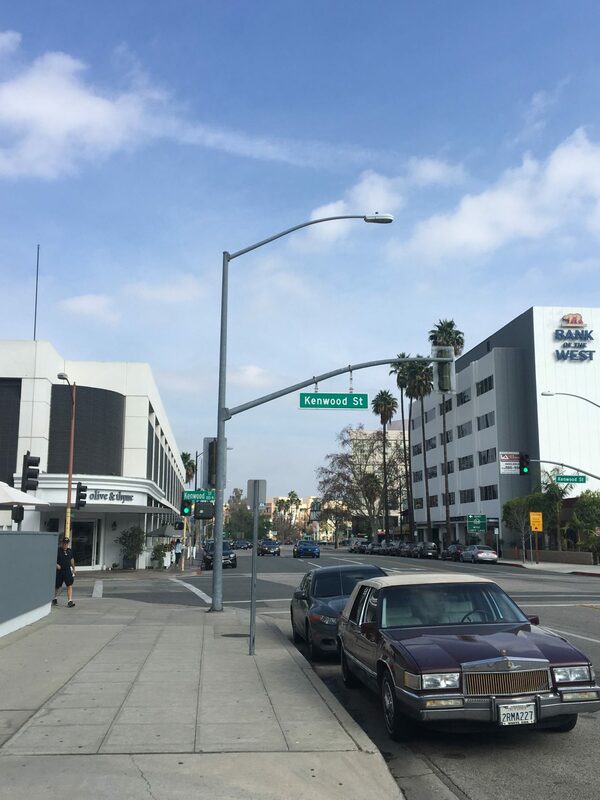 We didn’t have time to head to Downtown LA but I recently spotted that The Hoxton is opening a hotel there later this year and they always do really cheap room rates to coincide with the launch – tempting?! Have you been to LA? What was your favourite spot?